values. Our products are continually being further developed. Values, dimensions and weights can change as a result of this. Our specialist department would be pleased to offer you advice. We recommend you contact us concerning applications for our filters in areas governed by the EU Directive 94/9 EC (ATEX 95). (corresponding to the fluids in Group 2 of Directive 97/23 EC Article 9). Please contact us if you intend using other media. Subject to technical alteration without notice. terminal 2x6.3x0.8. The electrical vacuum pressure switch is connected via a blade terminal 2x6.3x0.8. 10.3 When must the filter element be replaced? filter element has to be replaced after the end of the shift. should be replaced after the trial run or flushing of the system. Afterwards follow the manufacturer’s instructions. 1. Stop the system and relieve the filter from pressure. 2. Unscrew the filter housing by turning counter-clockwise. 3. Pull the filter housing with element upwards and out. 5. 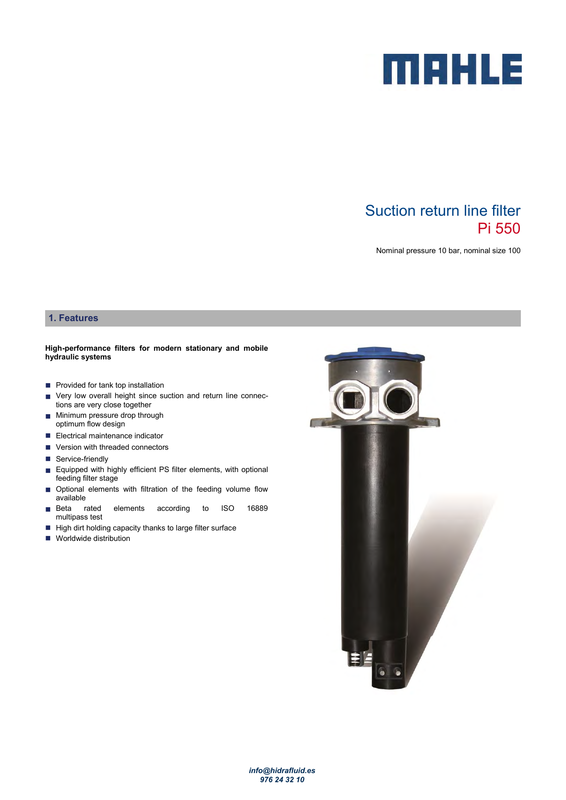 Clean the filter housing with a suitable medium. damage. Replace these if necessary. 7. Make sure that the order number on the spare element corresponds to the order number on the filter name plate. 8. Remove the filter element from the plastic sleeve and reassemble the filter in reverse order (points 1-4).